You are in for a surprise as you shall move on to try the new, yet simple recipes inspired from Thailand, Sri Lanka and Vietnam. 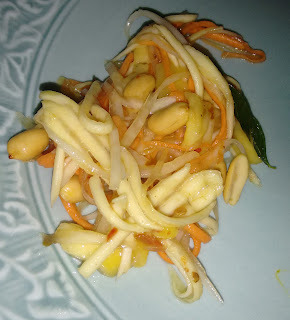 For example, the traditional salad is replaced by YUM SEE KLER, also called “Four friends’ Salad”, which contains tangy carrot, raw papaya, raw and ripe mango. Tossed with peanuts, this keeps you admiring the balance of the ingredients and sets your mood on the hunger track, where you want to delve for more. Another salad you may like to try is YUM MAMUANG, Chef Veena’s signature preparation: freshly grated green mango tossed in spicy and tangy Thai dressing. But do not let the salads fool you to think that the Summer Collection Menu is all about vegetarian dishes. Chef Veena admits that some of these recipes are her own, but born out of experimenting with different spices. 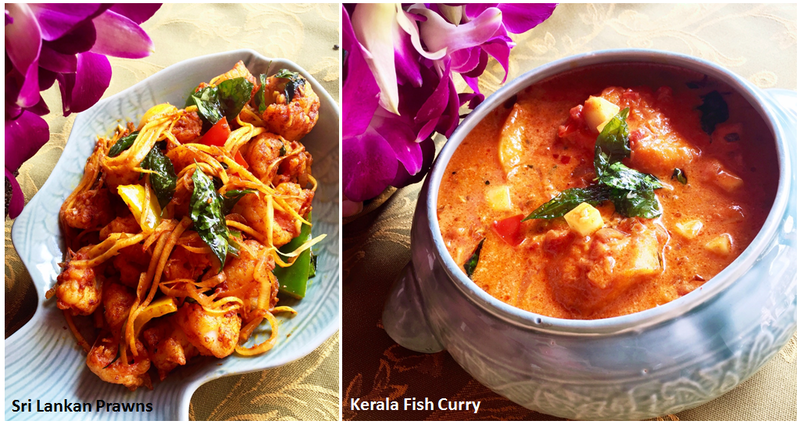 Next in the menu that is likely to catch your fancy are AMBA ISSO TEMPERADU and ALLEPPEY FISH CURRY. The first is a Sri Lankan preparation of prawns, stir fried with curry powder and slivers of raw mango, while the latter is a recipe from Kerala, as suggested by the name. It is fish fillet cooked in traditional Kerala curry and raw mango. For the chicken lovers, the menu features GA XAO HOT DIEU, a Vietnamese preparation of stir-fried chicken with ripe mango and cashewnuts. It has a subtle tangy taste, which makes it my personal recommendation for all food lovers. Mangoes dominate the main course too, where Chef Veena tosses up Jasmine rice with ripe mango cooked in coconut milk. I never knew one could cook rice like that! Also try the MAAMBALAM APPAM, or soft centered rice pancakes with mango. And if you still have space left in your tummy, finish your meal with the Vegan Mango icecream. For more photos, visit my Facebook page. i am a chicken lover and this looks very yummy!! !